Outlines exactly what information physicians want and how they want to receive it from healthcare leaders, peers, marketing executives, and physician relations representatives. Get the critical data that you need to succeed with your physician relations, referral, and communication efforts. In the wake of healthcare reform and a growing emphasis on accountable care, healthcare organizations are looking for ways to align more closely with physicians. Given the highly competitive physician recruiting and referral market, having an effective physician communication strategy has never been more vital. 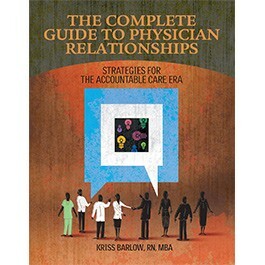 Based on extensive research and an in-depth survey of nearly 200 physicians, The Complete Guide to Physician Relationships outlines exactly what information physicians want and how they want to receive it from healthcare leaders, peers, marketing executives, and physician relations representatives. Get the critical data that you need to succeed with your physician relations, referral, and communication efforts. Chapter 1: What Do Physicians Want to Hear from Leadership? Chapter 2: How Does Your Hospital Compete? Chapter 4: What Do Physicians Want to Hear from Their Peers? Chapter 5: Do Physicians on the Medical Staff Know Each Other? Chapter 7: What Do Physicians Want to Hear from Marketing? How do physicians like to receive marketing information? Chapter 10: What Do Physicians Want to Hear from Physicians Relations? Barlow has spent her entire professional career in healthcare, and she is a well-known and -regarded expert in physician relations training. For the past 15 years, she's had the opportunity to use her knowledge from clinical and business development to support clients in physician relations—retention and sales, physician recruitment, and medical staff development. Her passion is growth strategy and working with teams to enhance medical staff relationships and referrals.